Chelsea Eichholz, our resident cheerleader, movie guru, and friend. Why she's lovin' it: When I was in high school, I found my friends -- my true, weird, amazing, wonderful friends -- in chorus and drama classes. We would sit in the hallway outside of the arts building during lunch and play games or hum showtunes. All the time. Because of the group of people I surrounded myself with, that time in my life became filled with musical theatre. I would listen to anything related to Broadway -- Wicked, Les Miserables, Little Women, Legally Blonde, You're a Good Man Charlie Brown, Godspell, Songs For a New World, Jekyll & Hyde (that one was a favorite), etc. -- and one of the soundtracks that I was drawn to most of all was The Last Five Years. I became a fan of it, really, after a friend performed "A Summer In Ohio" for our spring Broadway showcase in chorus (the same year I performed "Astonishing" from Little Women, which remains one of my favorite showtunes ever, SORRY). It was a hilarious, emotional little song. And when I found out that Norbert Leo Butz was in the original cast for the show... well, I was sold. I HAD to listen to the soundtrack on repeat. I was really interested to hear the new soundtrack of The Last Five Years (I still haven't gotten the chance to see the movie itself -- I know, I'm terrible), and this week I noticed that it was available to stream on Spotify. So, in desperate need of more Anna Kendrick after binging on the Pitch Perfect 2 soundtrack for days on end, I listened and I was blown away by the performances. Some songs are a bit shakier than others, some I found myself comparing to the original cast, but almost all are absolutely stellar. I fell in love with Anna as Cathy and Jeremy as Jamie. One of the songs I was most anxious to hear was "See I'm Smiling," arguably the most emotional song in the musical. Anna Kendrick absolutely exceeded my expectations. When Cathy begins to grow more and more angry with Jamie leaving her on her birthday to go to a party, you can hear the power and control in Anna's voice just surge and also you can hear the emotion behind it too, because as she inhales, it's sharp and wheezy, on the verge of hysterics. I was so incredibly impressed with that emotion and also "Climbing Uphill," which is an amazingly powerful song as well. Jamie can be a divisive character because he's the one who cheats on Cathy, but Jeremy's voice conveys all of his emotions during his numbers as well. Seriously, I wish I could find words to articulate how much I loved "Moving Too Fast." His voice had the perfect blend of control and full-on belt in that song. I was also really impressed with "If I Didn't Believe in You," which is one of my favorite songs in the show. Jeremy did an amazing job in layering the anger and frustration necessary into the song and captured the necessary gentleness of it too. Seriously, this week I'm just going to continue to listen to The Last Five Years' soundtrack on repeat and since it's available to stream, you all should do the same. Why she's lovin' it: Are you heartbroken that we've entered "Summer," the doldrums of television? Are you missing your regularly scheduled programming and desperately trying to fill the void of the hiatus? Well friend, have I got good news for you. There is a (more or less) undiscovered gem just waiting for you. A summer show so good, so tightly written, so expertly acted that everyone else should really just go home. I'm talking of course, about Power on Starz. Starz? I hear you asking your computer, perplexed. That's the channel with Outlander and pretty much nothing else. Why should I bother with Starz? Because, gentle readers, Starz is slowing making a name for itself in the cable TV biz, and Power is a huge part of that. The show centers around Ghost (played by the incredibly gorgeous Omari Hardwick) a major drug dealer struggling to go legit while his friends and family want him to stay in the drug game. His double life gets even more dangerous as he strikes up an affair with his childhood love, who (little does he know) happens to be a U.S. Attorney investigating the very drug ring Ghost runs. Power has the unusual pedigree of being headed by one of the few women showrunners of color around, Courtney Kemp Agobh as well as none other then 50 Cent in the role of executive producer. He also acts in this and he is shockingly good, adding more menace and threat into a simple smile then I ever thought possible. I know anti-hero fatigue is at an all-time high right now, but Power takes all of your expectations and flips them around. It's a crime drama, a character study, and a romance. The show also has a fabulous cast of interesting, layered, complex women. They are leads in their own right and while the focus is on Ghost -- the women clearly have the power. It's just starting its second season this week, and season one is imminently bingeable. Do yourself a favor and catch up now so you can enjoy season two all summer long. Why she's lovin' it: Gilmore Girls was the first show I truly fell in love with (unless you count Rugrats), the show that introduced me to fandom and shipping and everything great that comes along with that. If it weren’t for Gilmore Girls, I may never have become the crazy TV-obsessed person I am today. My life would have had a giant void with nothing to fill it but productivity. So naturally, the Gilmore Girls reunion panel this weekend at ATX Television Festival was a big deal for me, even if I couldn’t attend myself. Seeing pictures of my beloved cast together again was a dream come true, and while a movie may or may not ever happen, the reunion panel was more than enough to make up for it. At the panel, the cast talked about many of the questions that fans had at the end of the (disappointing) seventh season. What ever happened to Luke and Lorelai, did Rory make it as a journalist, how many children did Sookie and Jackson end up really having? They also addressed the million dollar question: who should Rory have ended up with? Among the actors who portrayed the three contenders, the general consensus seemed to be Jess. In true Lake Danes fashion though, Scott Patterson jumped in and said that none of them were deserving of Rory. Between the jokes and general camaraderie that comes with working on a show together for 7 years, the cast paid tribute to the late Edward Herrmann, a wonderful man and actor and the first to say that he would be at the reunion panel. While he died before the panel could come to be, his spirit was there, along with an empty chair reserved for him. The best part about the reunion panel was simply seeing the cast together again after all these years. So many of them have gone on to do great things but the panel really embraced the nostalgia of the show. Gilmore Girls is one of those shows that holds up well over time, the jokes still strong no matter how many times you watch each episode. Without a doubt, it goes down as one of the best family dramedies ever, dealing with the complications and joys that come along with living life. Stars Hollow and the cast of crazy people who lived there will always hold a special place in my heart. Why she's lovin' it: There are very few supernatural romance movies that can balance human connection and paranormal abilities as effortlessly as In Your Eyes. Part of its brilliance is that it doesn't look to explain what's going on supernaturally between the leads, Rebecca Porter (Zoe Kazan) and Dylan Kershaw (Michael Stahl-David) - it simply tells the story of two disparate people finding out that they have a very unusual connection and falling in love. Rebecca and Dylan have always had a connection. They can see and hear what they other does. From a sledding accident, to time in prison, to a stint in a mental asylum, they are always aware of thoughts and feelings that are not their own. They don't believe the images until the bond strengthens out of the blue and they can finally talk to one another. The beauty of the movie rests, not in the big moments of revelation and drama, but in the small beats of personal growth, confessions, angst, and confusion that feels entirely human. Rebecca is in a loveless marriage; Dylan is searching to move beyond his criminal past. Both feel trapped, neither know what to do about it. Kazan and David manage to convey pain, uncertainty, and the slow but firm crawl towards mutual love with a subtlety and nuanced performance that makes the sparks between them sizzle despite the distance physically between them. The banter is witty and the moments between them are brutally honest, funny, sweet, and ultimately loving. 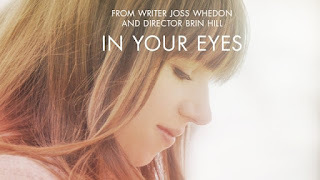 In Your Eyes is my romance movie of the week. Why she's lovin them: I finished my re-watch of Veronica Mars about a week before the Summer Lovin’ series started, which meant that I couldn’t talk about it here on Just About Write. Disappointing. But, I just started the second tie-in novel, Mr. Kiss and Tell, on Friday. That means I get to talk about Veronica Mars anyway! Haha, bad timing! You’ve been foiled by books! First, a little bit about tie-in novels: Most of the time, writers of the show itself do not write them – people hired specifically for that task, maybe with some help from the producers and writers of the show, do. On the scale of “canon,” tie-in novels usually sit well above fanfiction but still below the on-screen material. A lot of people think they’re sub-par wastes of time because they could be discredited by future episodes, but I’ve never thought that. I couldn’t even tell you how many Buffy the Vampire Slayer tie-ins I went through during middle school, and I never once cared that the stuff I was reading could be erased by the canon of the show at any moment. 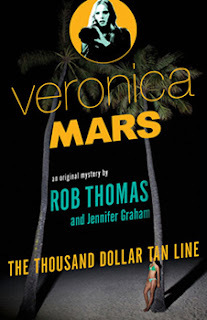 These Veronica Mars books are different from your usual tie-ins because they not only have the blessing of show creator Rob Thomas, but are actually co-written by him. That makes these novels, unlike other tie-in books published as promotional cash-grabs, canon. Super canon. Like, I can’t actually give you too many details just in case there are major spoilers for any future movies canon. The books each focus on one big case, plus some developments in the lives of the people we all know and love from the show. I was trying to figure out how the main cases would play out within a season of the show and I’d say they’re big enough for half or whole-season arcs: the first book, The Thousand-Dollar Tan Line, feels more like a half-season arc while the second could probably be a whole season. Both books take place some time after the Veronica Mars movie ended, and I’m happy to say that they don’t try and keep the status quo for the sake of any hypothetical future films. Things change in Veronica’s life – huge things – over the course of these books. Like I said: spoilers. In the novels, we find out how Veronica is living after deciding to stay in Neptune, how the town is handling the corruption that was revealed at the end of the movie, Mac’s role as a part of the Mars Investigations team, Veronica’s relationship with Logan, and (this was a big deal for me) the aftermath of Weevil’s storyline in the film, where it looked like he’d gone back to being in a biker gang and left his lovely family behind. Most of that last bit is found in Mr. Kiss and Tell. All the good stuff from the show is present in the books – probably due to, you know, the whole “Rob Thomas is writing them” thing. The show-caliber witty dialogue, twisty-turny mysteries, sardonic inner monologues, and wonderful characters all make reading highly enjoyable and everything feels true even though the stories aren’t playing out on a TV screen. Wallace still loves snickerdoodle cookies. Veronica and her father still exchange clever banter. Logan and Veronica are still really complicated. It’s so easy to picture everything as it would happen on the show (or films), easy to see and hear the characters inside your head as they make certain expressions or say things a certain way. It’s extremely fun… but also, anyone thinking of reading these books should be aware that, all the bad stuff in the show? The murder, assault, and general noir-inspired grunginess? Applies to these books, with the addition of characters being allowed to swear and say things they would not have been able to say on TV. Discretion advised, and all that. Also, Veronica gets a pony. Kind of. It’s an inside joke. Why she's lovin' it: Over the past few years, I’ve slowly stopped watching most TV shows. Too many great shows were being cancelled and I just did not care to start most of the new pilots that came around each year that were inevitably headed towards cancellation. Most shows that last are just boring, regurgitated versions of the crap that is already on. YouTube has been the source of most of my entertainment, mostly from wonderful vloggers like Grace Helbig and Hannah Hart, but my great friend Bethany forced me to watch this little web series that she was convinced I would love. After putting it off for a few months, I finally gave it a whirl and I hate that I ever doubted her. Carmilla is loosely adapted from J. Sheridan Le Fanu’s novella, the vlog format show takes place at the fictional Silas University in Styria, Austria, where strange is the new normal. Season 1 is told from the perspective of naïve freshman Laura (Elise Bauman) who is investigating the disappearance of her roommate and other girls on campus when the mysterious Carmilla (Natasha Negovanlis) is suddenly assigned to replace her missing roommate. Spoilers for the rest of the season 1: Carmilla is not only behind the disappearances of all the girls but is also a 300+ year old vampire. She is forced by her mother to gather all of these girls to be sacrificed or else all hell could break loose. While Laura is investigating and discovering all of this, she finds herself falling for her new roommate and Carmilla goes to great lengths to protect her. The real highlight of the show is the cast, which is made up almost entirely of women and one non-binary person, and the representation of various queer characters. Gone is heteronormativity, as the show paints a normalized world where being gay is just as common as the sky being blue. All of the characters are built up and get their time to shine and they get to be complex and important. Laura is very dorky and sheltered, having grown up with an overprotective father but she is headstrong, courageous, and can defend herself. She accepts that she is naïve but that doesn’t stop her from doing what she feels is right. After getting off on the wrong foot, Carmilla finds herself drawn to Laura’s unyielding sense of good and begins going out of her way to keep the girl safe from her mother.